is live 12/2 at 6pm central and ends 12/16 at 11:59pm. Make sure to enter the Grand Prize $200 PetSmart Giveaway. Steak, Potatoes, Veggies, the whole nine yards! 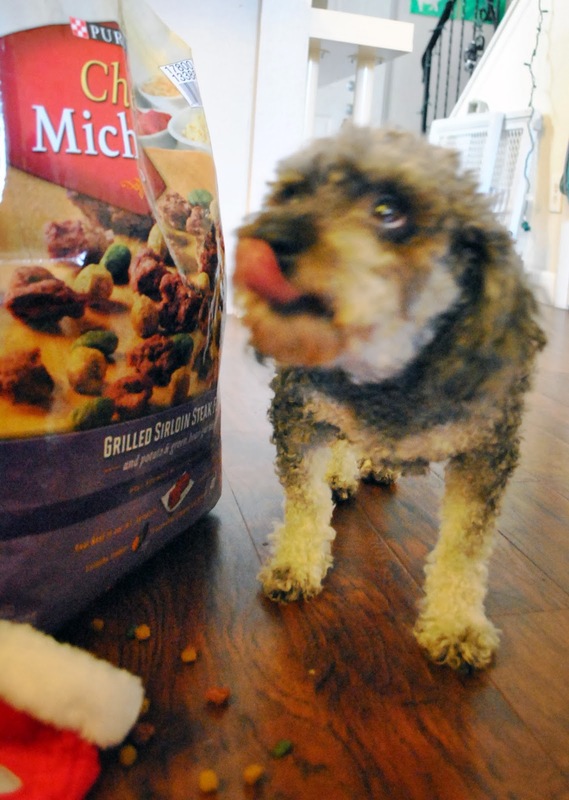 Why should you choose Chef Michael's for your dog? These are meals for your animals, far from ordinary but perfect for everyday! and his little nub of a tail starts wagging. It's pretty awesome to know that my dogs actually have a favorite meal. 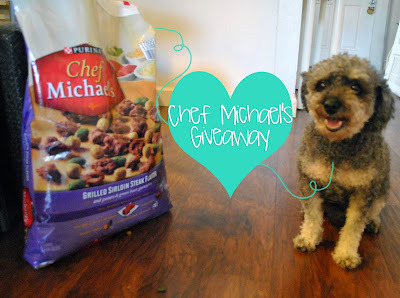 several of my readers the chance to win a truly delicious meal for their furry friend. FOUR FULL-SIZE BAGS of CHEF MICHAEL's!! Disclaimer: The It's Christmas Pet Edition bloggers are not responsible for sponsors that do not fulfill their prizes. I was in no way compensated for this post, I was however provided with a product coupon to facilitate a review. All opinions expressed above are my own. If you are a company or blogger that would like to be included in an upcoming review/giveaway, please click here to e-mail me. My fav treat is a carrot! I have 4 dogs. Their favorite treats are about anything - especially chicken. We have a black lab/German Shepherd mix (though she looks just like a lab!) 5 mo old puppy named Ali. Her joy comes from running around the house playing with her toys - most of which have been destroyed in some way. I keep a routine for her in having her help me carry out her toy box every morning from our bedroom to the living room, followed by her "blankie" and pillow & then doing the same thing back to the bedroom at night. She also knows it's time for bed when she receives her "bedtime biscuit" - she's just too cute! I have 3 dogs. Rocky my rottenlab. (rottweiler and lab) he is a great guard dog. Sasha our pet rescue, not sure what she is really she looks like a miniature lab. We think she may be lab and beagle, but she is a sweetheart. And our Boxer who's name is Dexter after the show of course. He is a scatter brains but we love him! Well, I have five Treeing Walker Coonhounds and except for my senior girl, the others love toys of almost any kind. Outside they really like playing with balls and those long, knotted ropes (they play tug-of-war and keep-away). Inside they play with plush squeaky toys and smaller ropes. I just bought a "Babble Ball" that my two boys just love, even though they are a bit confused - and sometimes just a little scared - of it. my 4 german shepherds are amazing we have 2 black and tan saddle backs (mother and daughter) and 1 longhaired plush grey and brown sable, and one standard black and tan male the rest are female they are our family and they all love treats for tricks! their favorite treats are pigs ears! My dog's name is Cricket, and she loves stuffed animals. She also likes this kind of dry food better than most others we've tried. My dog Odin is a rescue actually a double rescue. He was in the police program and failed and they sent him to Ames (experiments) a guy who went to school there rescued him. When the fella graduated he couldnt take Odin with him and we adopted him! I have 2 dogs and they couldn't be more different. One likes to stay indoors and be doted on, while the other always wants to be outside running, playing and exploring. Even though they are different I love them the same! My dog's name is Vicki though I tend to call her Vix. She adopted me about 11 years ago and is elen and a half years old. Her favourite dry food is ByNature, though her favourite meal is anything meat. Generally she gets a cup or so of meat (salmon, chicken, tripe, beef or pork) with about 1/8-1/4 cup dry kibble. Yes, she's spoilt but she's a sweetheart. Thanks for the giveaway. My chihuahua Little Bit's favorite toy is a stuffed hamburger!! She carries around like a security blanket! My dog is crazy.... she is not allowed toys at home because she likes to swallow them which can give her bloat. Yet she does not do this action at daycare so not sure her favorite toy there. I have a 6 year old Dobie mix named Froggie. Her favorite food (she thinks) is whatever I am eating. She loves interactive/puzzle toys and her stuffies. Shiloh is a 4yo Shetland Sheepdog. He loves just about all treats and toys. His favorite toys though are his soccer ball and his chase-it toy (flirt pole). I have 2 dogs and 1 cat who are very spoiled. Most of the day they are laying in my lap or in our bed under the covers. I have a little Jack Russell mix named Raven and she loves Busy Bones!